After Almanaar (GB) took home his first United States victory in last year's Grade I Gulfstream Park Turf Handicap, owner Shadwell Farms' Racing Manager Rick Nichols had the Grade I $1,000,000 Arlington Million in the back of his mind for the son of Dubawi (IRE). Unfortunately, some setbacks put him on the shelf for the remainder of the year, so the connections are looking to make up for such lost time when they contest this year's edition of the Million. Trained by Chad Brown, Almanaar has only run once since the Gulfstream Park Turf Handicap in an allowance optional claiming event over the turf at Belmont Park on June 8. In doing so, he defeated a trio of graded stakes winners including stable mate Ticonderoga, King Kreesa and Glenville Gardens. In the 1 1/16-mile event, Almanaar sat well off the pace and appeared a bit rank in the early stages of the race. Despite getting angled wide at the top of the stretch, he did not require much asking and was never asked by jockey Joel Rosario. He held off a late charge from stable mate Ticonderoga to win under a hand ride by a neck and galloped out with authority. Almanaar began his racing career in France, where he won the Prix Paul de Moussac and the Prix Daphnis (both Group 3 events) in June 2015. He made his United States debut when coming off of a 13-month layoff in a Belmont Park allowance event in September 2016, where he finished fourth. Almanaar showed improvement in his following starts with a third-place finish in an allowance race over the Belmont Park inner turf in October 2016. He then finished second behind Flatlined in the Grade II Fort Lauderdale Stakes in January of following year. 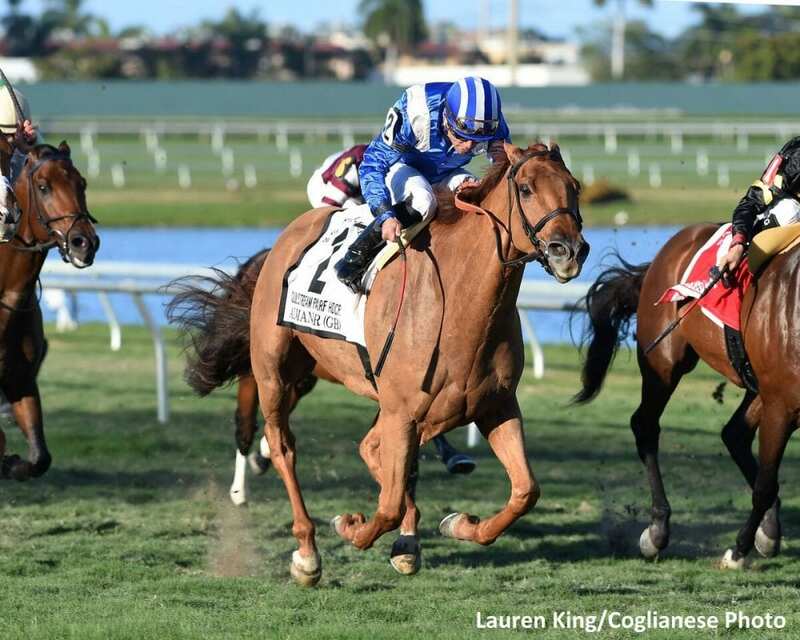 Following the Gulfstream Park Turf Handicap in February 2017, Almanaar continued to record works at Palm Meadows Training Center in Boynton Beach, Florida, where Brown keeps his major string of horses in the winter. In early December of that year, he shipped to Camden Training Center in South Carolina where Shadwell keeps a small operation. So what gives Nichols confidence that Almanaar can score a Million victory in his second race off the bench? In 15 career starts, Almanaar has made six trips to the winner's circle with only four off the board finishes and has secured lifetime earnings of $491,849. He is out of the Bahhare broodmare Baqah (IRE) who won the Group 2 Prix de Sandringham at Chantilly in 2004. Trainer Chad Brown will also be represented by graded stakes winners Robert Bruce (CHI) and Money Multiplier in the Million. He will be going for his second victory in the prestigious turf event after a win in last year's edition with Beach Patrol. This entry was posted in Breeders' Cup and tagged almanaar, arlington, arlington million, Chad Brown, Dubawi, gulfstream park turf handicap, rick nichols, Shadwell Farm by Press Release. Bookmark the permalink.